Most reliable image restoration program is fully capable to recover and revive lost image files from memory cards due to internet virus, software malfunction and other reasons. Comprehensive photo revival application allows users to rescue entire damaged picture contents without degrading computer system performance. Digital picture restoration application is used to undelete removed or erased digital pictures from major brands of removable devices including Jet flash, HP, Kodak, Seagate, Transcend, Nikon, Samsung, Konica, Kodak, Kingston, Panasonic, Sony, Canon and many others. Easy to operate Digital Picture Repair Software has ability to retrieve and repair all major image formats such as jpg, jpeg, tif, bmp, gif etc. Amazing picture undelete program recovers digital image files from USB drives while system generates different error messages such as device not recognized, undetected USB removable media drive, device not connected etc. Digital image repair tool easily revives lost pictures, corrupted image files, damaged photo files and erased memorable snapshots stored at different memory location of your computer system. Technically sound Digital photo revival application requires no technical skill and expert guidance to recover and retrieve deleted digital picture files and folders. For reviving and restoring lost digital stunning pictures from your corrupted drives download free trial version of Digital Picture Repair Software available at our company website www.memorycardrepair.com without requiring any technical skill. 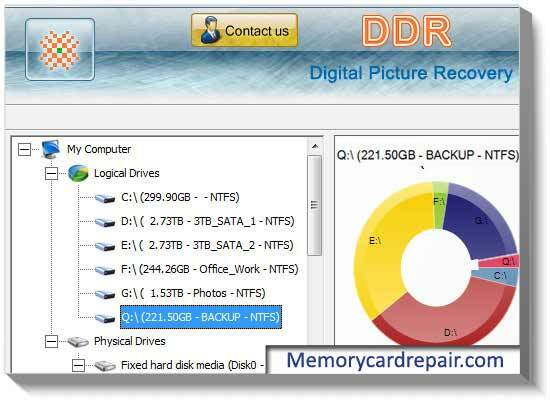 Important Features: *Efficient digital picture recovery software is used to salvage lost deleted photographs from formatted or reformatted hard disk drives. *Time saving photo revival application provides facility to repair corrupted image files of any format and size in major data loss situations. *Digital picture retrieval utility recovers formatted images due to accidental file deletion without requiring any expert guidance. Top 4 Download periodically updates software information of Digital Picture Repair 5.3.1.2 full version from the publisher, but some information may be slightly out-of-date. Using warez version, crack, warez passwords, patches, serial numbers, registration codes, key generator, pirate key, keymaker or keygen for Digital Picture Repair 5.3.1.2 license key is illegal and prevent future development of Digital Picture Repair 5.3.1.2. Download links are directly from our mirrors or publisher's website, Digital Picture Repair 5.3.1.2 torrent files or shared files from free file sharing and free upload services, including Rapidshare, HellShare, HotFile, FileServe, MegaUpload, YouSendIt, SendSpace, DepositFiles, Letitbit, MailBigFile, DropSend, MediaMax, LeapFile, zUpload, MyOtherDrive, DivShare or MediaFire, are not allowed! Your computer will be at risk getting infected with spyware, adware, viruses, worms, trojan horses, dialers, etc while you are searching and browsing these illegal sites which distribute a so called keygen, key generator, pirate key, serial number, warez full version or crack for Digital Picture Repair 5.3.1.2 download. These infections might corrupt your computer installation or breach your privacy. A keygen or key generator might contain a trojan horse opening a backdoor on your computer. Hackers can use this backdoor to take control of your computer, copy data from your computer or to use your computer to distribute viruses and spam to other people.